UNITED NATIONS (CNN) -- After expelling aid organizations in March, the government of Sudan is letting some back in the country, the United Nations humanitarian chief said Thursday. 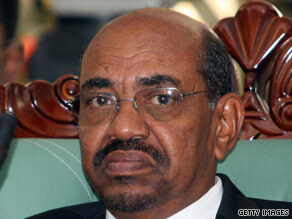 Sudan president Omar al-Bashir is the first head of state ever indicted by the ICC. Organizations such as CARE, Save the Children, Mercy Corps and PADCO applied for new registrations and they have been accepted, said U.N. humanitarian chief John Holmes. Asked about other groups, he said, "whether they want to go back or not is up to them after what happened in the course of the year." Sudan expelled 17 non-governmental organizations from the country on March 4 after an arrest warrant was issued for Sudanese President Omar al-Bashir by the International Criminal Court. Sudan's government representatives have "made clear" that humanitarian agencies and non-governmental organizations were welcome and valued in Sudan, Holmes said. Internally displaced people in Sudan remain at risk, particularly in the rainy season and the "hunger gap season, which is also upon us," he said. The World Food Programme said the hunger gap season runs from May to October, during harvest time. During the season, groups distribute food to more than 3 million people, the organization said.